Americans are different when compared with the citizens of other wealthy nations. Americans are more religious and more likely to believe individuals control their own destiny. They also are more inclined than most to say military force is a necessary component of international affairs and are more likely to think their own culture is superior to others. On many issues, Americans share values with their traditional transatlantic allies in Europe, but on others – especially issues related to religion – Americans more closely resemble the publics of developing countries. Throughout much of the world, there is a strong link between wealth and religiosity, with religion playing a much less central role in the lives of people in richer countries. In poor countries in Africa, the Middle East, and Asia, religion remains extremely important in the lives of individuals, while in wealthy nations, secularism is more common. One very wealthy nation, however, does not fit the pattern: the United States. Americans are considerably more religious than their level of prosperity would predict. To examine the relationship between wealth and religious belief, a three-item index was created, with “3” representing the most religious position. Respondents were given a “1” if they believe faith in God is necessary for morality; a “1” if they say religion is very important in their lives; and a “1” if they pray at least once a day. Consistently, poor countries receive higher scores on the scale, with Senegal (mean of 2.81) and Indonesia (2.81) receiving the highest scores of all. On the other hand, wealthy countries tend to receive lower scores. The six relatively rich Western European countries, for instance, are among the most secular included in the survey, and with a mean score of .24, Sweden is the most secular. 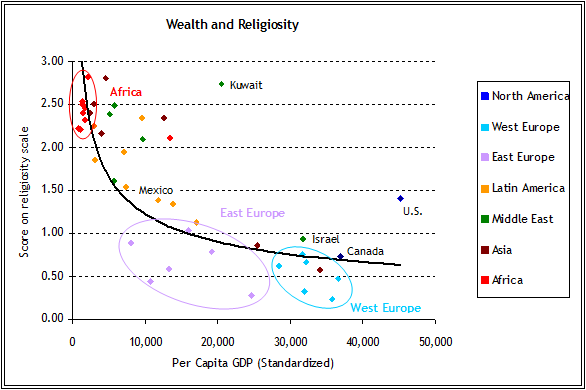 Other wealthy nations, such as Canada, Japan and Israel, also have low levels of religiosity. However, the wealthiest nation of all, the United States, is in the middle of the pack on the religiosity index. The level of religiosity in the U.S. is similar to less economically developed countries, such as Mexico, Venezuela and Lebanon. Oil-rich and predominantly Muslim Kuwait is another country with a much higher level of religiosity than its economic situation would predict. This also is true of Malaysia and South Africa. Meanwhile, the formerly communist nations of Eastern Europe are somewhat less religious than might be expected based on their per capita GDPs. Individualism has long been considered a core American value, and as this survey highlights, a widespread belief in individual responsibility sets Americans apart from much of the world. Along with their Canadian neighbors, Americans are more likely than other publics included in the survey to disagree (64%) with the notion that success in life is determined by forces outside of our control. American views vary somewhat, however, according to partisanship and income. Just over four-in-ten Democrats (42%) agree with the idea that success is determined by outside forces, compared with 29% of independents and 22% of Republicans. People with household incomes below $30,000 (44%) are more likely than those earning $30,000-74,999 (31%) or those with incomes of $75,000 or more (21%) to say that success is often beyond control of the individual. Outside of North America, there are large variations within regions. In Western Europe, 71% of Italians say success depends on forces outside of a person’s control, but only 33% of Swedes agree. In Asia, eight-in-ten Bangladeshis and Indians agree with this perspective, while the Japanese, Malaysians, and Indonesians are roughly split on this question. And in the Middle East, while 69% of Lebanese feel success in life is often beyond a person’s control, but this view is shared by only 37% of Egyptians. Since 2002, the percentage of people who agree with the notion that success is beyond an individual’s control has increased in 13 countries, remained basically the same in 15, and declined in seven. Declines in agreement have been particularly steep in Lebanon (-12 percentage points) and Ivory Coast (-10), two countries that have experienced considerable turmoil and violence in recent years. Americans are among the most likely to believe military force is sometimes required in world affairs. More than three-in-four Americans (77%) agree with the statement, “It is sometimes necessary to use military force to maintain order in the world,” and 35% completely agree with this perspective. And despite sharp divisions along party lines over the current conflict in Iraq, partisan differences on this question are relatively muted. Republicans (90%) are more likely to believe military force is sometimes justified, but even among Democrats (73%) and independents (77%), large majorities agree with this position. 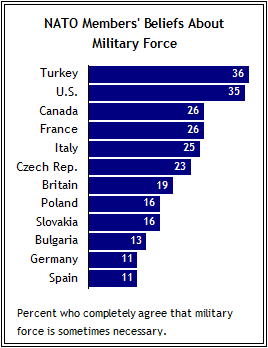 Especially when compared to publics of NATO allies, Americans are more likely to think military force is sometimes needed. Turkey is the only other NATO country in the survey where a similar share of the public completely agrees with this principle. In Germany, where an aversion to military force has been widespread since the end of World War II, nearly six-in-ten (58%) reject the notion that war is necessary to keep order, setting Germans apart from their fellow Western Europeans. Similar attitudes are found in other nations as well, including Egypt (59%), Jordan (58%) and South Korea (53%). Overall, however, there is a consensus among most of the publics surveyed that military force is sometimes justified. In 39 of 47 countries, a majority agree that order must occasionally be maintained through military force. The countries most likely to agree with this principle include several that have been deeply involved in military conflicts in recent years, such as Kuwait, the United States, and Israel, as well as several that have not, including Brazil and Sweden. Publics in longtime rivals India (90%) and Pakistan (72%) are also among the most likely to agree that military force is sometimes necessary. Americans are also more likely than most Western Europeans to think their culture is better than others. Over half of Americans (55%) agree with the statement, “Our people are not perfect, but our culture is superior to others,” a larger percentage than in Canada, Spain, Germany, France, Britain and Sweden. 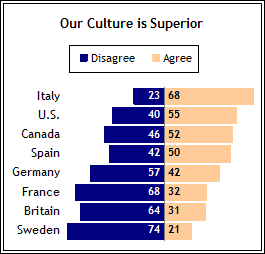 But Italians are even more confident than Americans in their cultural pre-eminence; 68% of Italians believe their culture is superior. In the context of all 47 nations, however, Italians are in the middle of the pack. The belief in a country’s cultural superiority is common across all regions. Germany, France, Britain and Sweden are the only countries where more than half disagree with this notion, and in 20 countries more than seven-in-ten agree their culture is best.